Where I Have Been For the Last Four Months? So let’s go over the big question I’ve got a few times, “Hey Scott, where were you for the last four months or so?”.The short answer is “busy”. The long answer is “very busy”. I recently left my day job to pursue my MBA full time, rather than part time. I’ve also been spending time finishing up writing duties on two separate independent comic series “Good Samaritans” and “Vis”. That’s right- now you guys can make fun of my comics like I do to yours (revenge is sweet isn’t it?). I’ve had the pleasure of working with some absolutely fantastic artists and editors during this process and it has been very illuminating. That being said you can now check out my first comic, Good Samaritans #1 for FREE on DriveThruRPG and keep up with my work on Facebook at Scott Gladstein Presents. An honest to God solid Christian multi-publisher crossover. Ok so today I am going to do something a little different. I normally review only Issue #1s but today I am going to take a look at “The United” which, while technically a #1, is actually a mega crossover event between 10 Christian themed superheroes. I am totally in support of Indie crossovers and I was very excited to come across this one. For better or for worse- I am going to check out The United #1. Let’s give it a look. The layout is very reader friendly- as a 10 character crossover has to be. We have a character page with headshots and names of all the characters and when we are introduced to them we are given a small blurb about their abilities. This is helpful and not super intrusive. The lettering is not fantastic. The introduction uses some very stock fonts in big, poorly laid out, exposition blocks. In panel the lettering is odd. Sometimes it is stretched or warped oddly but you can read it without issue. The art style is very stroke-heavy and is something I’d more expect to see in a horror comic but it is very detailed and it works. Someone obviously put a lot of love into the art for this comic and it shows. There are some anatomical oddities and inconsistencies but overall it’s fluid and is more a stylistic thing than anything. My only other real complaint is that due to the high contract and stroke-heavy nature of the art sometimes it is a little hard to follow if there is a large number of characters on the page. While not on the professional level- it isn’t a bad attempt and every scene has a plethora of “things” going on (as opposed to the empty background a lot of indie comics have). What we get out of this comic is a good old-fashioned superhero beatdown. I was skeptical of this comic until about page 7 because that page features a whole host (see what I did there? pun pun) of heroes just beating the living hell (I got a million of these) out of some robots on a beautifully done splash-page. THIS is what crossover comics are about. In short, they have all been summoned by what is essentially the Devil (who has a rather fun and unique character design). A lot of Christian comics I have reviewed in the past were very preachy and (pardon the pun) black and white about morality. “God is good” is the only message we get and we are never introduced to the complexities of matters of morality and faith. I’m not religious and that always put me off about them. This comic doesn’t do that however. Right off the bat we are given some very valid reasons as to why God is a jerk by the antagonist. He talks about how God turns his back on the weak, punishes the innocent, and is wrathful at seemingly random times. While we (as readers) and the heroes are never going to side with the Devil on this one- this is a legitimate test of faith for the characters. We get some good back and forth from these characters and they show their devotion in their own way. Some quote biblical passages, some are silent, and some show their colors by simply quipping back but no one falters in their faith. A scumbag even calls them, “super-powered Jesus freaks” and that shows that the writer is not afraid to address the absurdity of the premise within the context of the real world. It makes it more believable and human- something a lot of superhero comics lack. If there is a weakness to this comic- it is the overall plot. We have a bunch of kind of directionless plot threads that are just kind of thrown at us. They are fun visually but we aren’t made privy to exactly why some things are happening or what their overall goal is. Honestly- I wasn’t looking for Les Miserables from a massive crossover book but it would have been nice to see a more coherent story put together all the same. Overall- this comic defied my expectations. I expected to get a moralizing yuppy Christian book with a bunch of, as the comic puts it, “superpowered Jesus freaks” but what I got was a lot of fun. It was a fast paced beat ‘em up with more characters than I could shake a stick at. It wasn’t overly long and while the overall direction was a bit messy it had a very good approach to the whole concept. Give it a read. Something is just not right about this horror comic. Today we’ve got another horror comic. This time rather than some generic monster we have Spring-Heeled Jack. For those not familiar with the myth Jack is a character out of victorian England and was something of an urban legend. He has some connections to devil (eyes of fire, clawed hands, etc) and some “gentlemanly” aspects to his appears. He has appeared in a lot of media and has been adapted into many comics over the years. That being said, let’s jump into Spring-Heeled Jack and see if this is “just another Spring-Heeled Jack comic” of if it is something special! The art isn’t my favorite style but it’s well done and fits the comic’s tone. It’s done in a style that shows a lot of the brushstrokes and uses a very flat pallet. It’s a good mood setter and it’s well-drawn with a lot of use of shadow and contrast. When we finally see Jack a few pages in he matches his description though have a very “vampiric” quality about him. The lettering is clean and legible however- exactly how it needs to be and it matches the feel well enough. The second act totally changes everything. While the same art style is used, without the heavy shadow and dark colors to hide it- there is some sloppy art. There are a few instances of odd and inconsistent proportions, some panels lacked background that should probably have them, and the character designs are not as novel in this sort of light. It takes on some vaguely manga inspired aspects later and it kind of clashes a little (though one could argue that there is a pervasive influence that is just more highlighted more later on). There is not a lot of dialogue but that shows an understanding of the medium. I’d be surprised if the first act of the book had more than 100 words of dialogue- but it doesn’t need it. This is a good example of how to “show” not “tell”. It starts with a chase and we are not inundated with exposition about the situation. It just “happens” and we are given enough context clues to figure out the rest. I gotta say- I was not a big fan of making this a Sherlock Holmes story. Half way through we are introduced to “Mr. Arthur Doyle”, a not-so-subtle Holmes pastiche (Sir Arthur Conan Doyle wrote the Holmes stories). I’ll give them credit- the character looks like the real life Doyle a bit so that’s a nice little touch. I am not sure if they meant it to BE him or to be someone LIKE him. We also have his Lestrad stand in “O’Brien” and his Wattson stand in “Joe” (though he is a fair bit more astute and active than his literary counterpart). Joe is based on Joseph Bell, a forensic surgeon who Holmes was based on in part. I’m 90% sure they are posing this as some sort of historical fiction with supernatural elements but it just kind of feels like they are using it for the sake of name recognition. We see Jack do some supernatural things (breath fire, take bullet hits without issue, and some claws) and the “law” of Holmes is that while something may seem supernatural- it never is. Science and deductive witt always shines light on it and it is revealed to be a sham. Part of me really hopes the story ends in that fashion but I get this feel like it would be a bit of a let down at the same time. We have the titular character seemingly possessed of supernatural abilities and this is one of the only aspect of the comic left in questions really so if it was all some stage magic or something I feel like that might take some of the “umph” out of the excellent first scene. Overall, despite my gripes about it, this is not a bad comic. It’s not a godsend but it’s pretty inoffensive next to things like HellOhGirl or Kinesis or whatnot. If this is your kind of thing you are going to enjoy it. I wasn’t particularly thrilled. It started off good and the art is interesting but the rest kind of falls flat. For something 23 pages long not much happens and it doesn’t quite resolve itself. That is not to say that it needs to in the 1st issue, but I can’t say I’m terribly interested to see where Mr. Doyle goes. 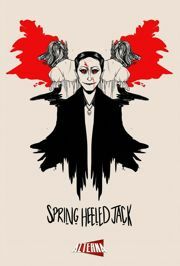 All and all, Spring Heeled Jack is your basic boogie-man despite his name. Professional with a great premise. So Parallel Man relies on the concept of the “multiverse”- a series of infinite (or near infinite) interconnected alternate universes just next door to each other. This is a concept very much steeped in the lore of American comics as this is the universal logic employed by most major publishers to tie their stories together. The premise of this comic is original- in the vastness of the multiverse one version of America developed the ability to jump to different realities and conquer them because they destroyed their own world. I’m sold on the premise and the cover art looks gorgeous so let’s jump in and see if it delivers! The art is top notch. It is done in a style similar to that of most major publishers and doesn’t fail to impress. You guys know I’m something of an art snob- but this is done with a deep understanding of the medium. It’s in full color, uses dynamic angles, and it’s expressive. They have some very invocative imagery- a shattered Lincoln memorial implies a loss of freedom, Air Force One, and an alternatively colored american flag. Hey- they even got Obama in there for a bit and did a fair likeness of him. I gotta say though, for all the high praise I am laying on this thing, when we finally get to see the universe-jumping military their appearance fails to impress. The big intro on page 9 just kind of looks like a line of very cookie cutter soldiers in generic “space soldier” style armor of the same height and build. Given the details on earlier pages, I was ready for some realistically diverse and very imaginative soldiers- not something that bland. However- that is about the only misstep in the creativity department (see the story section for more on that). The lettering makes me envious. They do more than just your standard boxes and onomatopoeia. The text is legible, the onomatopoeia is creatively applied, and non-interruptive to the beautiful art. They use a variety of balloon and font styles, when appropriate, and it just adds to the already very professional appearance of the comic. Honestly- if I didn’t know better, I would assume that this was something produced by Marvel, DC, or Image. There are some kind of over the top names for things like “hellfighters” and a lot of techno jargon that is meant to sound scientific, but overall the writing is a solid B+ or A-. It does its job and does its word building without giving us too bad of an exposition bomb (aided by the first page’s short introduction). The dialogue comes off as natural and does a great job handling such a weird premise. When compared to the overall direction thus far- the worldbuilding is the shining gem. The premise works and is used to great effect. 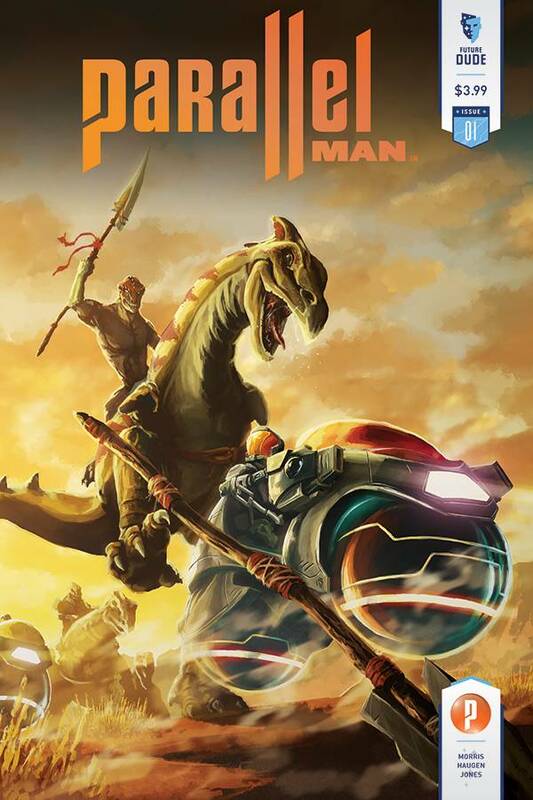 We are immersed in the world of the reality-hopping Nick Morgan and his sidekick, a computer program named Atlas.The various universes we get to see showcase the powerful imagination (both in an artistic and worldbuilding sense) that this team can bring. We see megalithic vehicles, crazy alien designs, mushroom forests, . They do rely on “science as magic” a bit heavily and kind of ham-handedly in the narrative sense (a “nanopatches fix everything” kind of setup) but I think it was done to keep the focus of the comic on the premise rather than the minor details. We get a slow-ish start with the real plot kicking in about half way through the first issue and don’t really get a full understanding of it until about 10 pages before the end. That’s not to say there is a pacing issue, more that they handle it pretty well. There is a bit of tonal shift near the end that I wasn’t so fond of, but it looks like it will set up some interesting character dynamics in later issues. Overall, I dig it. It’s a solid premise with a lot of mileage in its premise. The first issue does a great job of setting up a lot of issues to come. This comic is about as professional as indies get- great art and some solid writing. I’m on-board with this one.